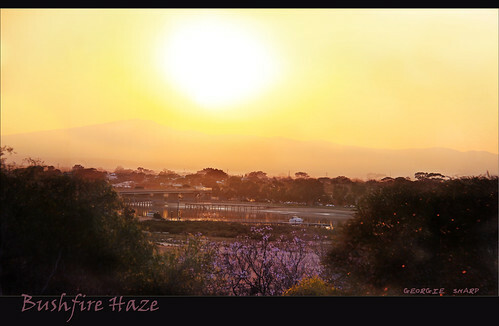 Bushfire Haze, a photo by Georgie Sharp on Flickr. I have been waiting for the Jacarandas to bloom, the purple trees look lovely in the landscape, especially when looking out across the town, but smoke from the Central Australian bush fires has smudged the clean horizon. When we visited Alice Springs earlier this year the park ranges and aboriginal elders warned of this bush fire season. Several burn offs had been done but the unseasonable rain had brought new growth which was difficult to contain over such a large area. Moody Morning 2, a photo by Georgie Sharp on Flickr. Spring time and the weather is changeable jumping from cool and windy days to warm and sunny followed by another cool change often accompanied by a strong wind. Not the best weather for photography but occasionally there are some stunning moments like this one when the sun peeped out for a few minutes.